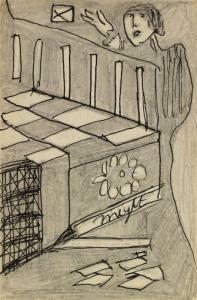 Find artworks, auction results, sale prices and pictures of Madge Gill at auctions worldwide. 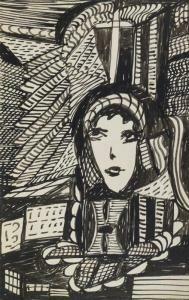 Madge Gill, British 1882-1961- Untitled/study of a woman; pen and blue ink on postcard, inscribed on the lower left and dated 1930 on the reverse, 14x8.3cm: together with nine other studies in pen and blue ink on postcard by the same artist, ea. 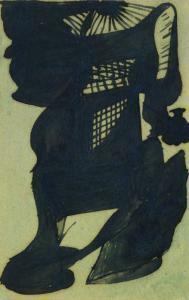 14x8.3cm, (10) (unframed) (ARR) Provenance: Purchased from Eric Estorick by the present owner. 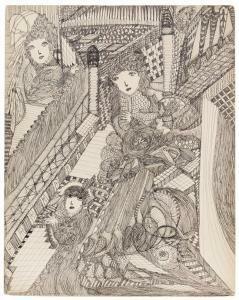 Madge Gill (British, 1882-1961) Untitled ink on poster board unsigned 25 x 20 inches. 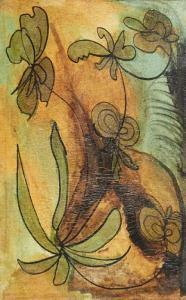 Property from the Collection of Yolanda Saul, Collector, Curator and Author This work has paper wear in all 4 corners. There is dirt and grime in bottom right corner. There are 3 water spots in bottom left quadrant. General patina consistent with age. Otherwise this work is in overall good and stable condition.